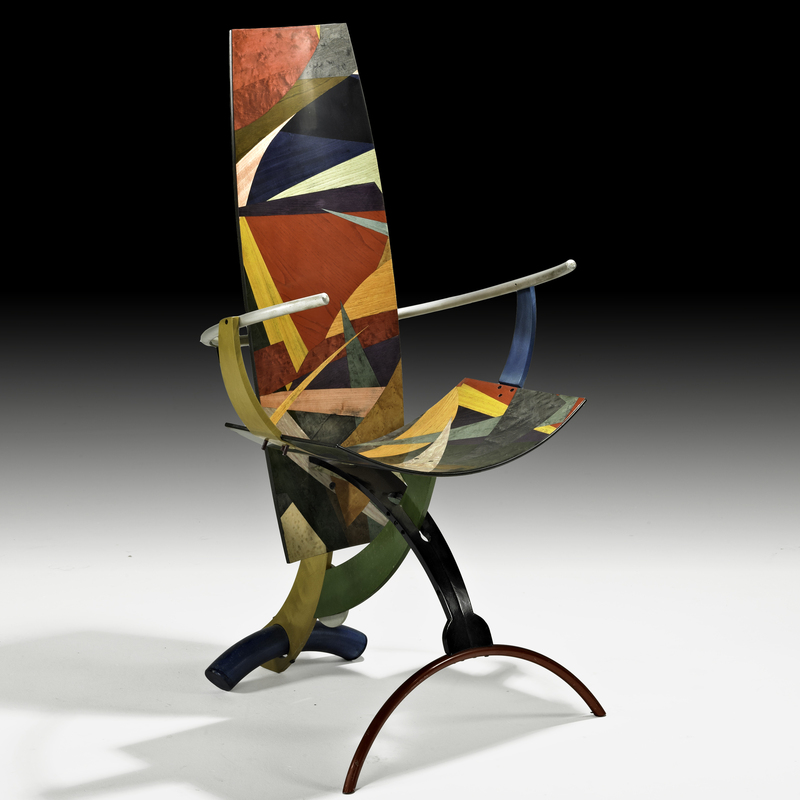 Aficionados of antiques, decorative arts, and furniture, or simply admirers of artistry and design, can find plenty to see and learn at all of the events and exhibitions associated with Four Centuries of Massachusetts Furniture , a collaboration of eleven institutions designed to put the spotlight on Bay State craftsmanship. You may not have been aware that this past Tuesday, September 17th, was declared Massachusetts Furniture Day by our own Governor Deval Patrick! The announcement was made at the State House with the chair of John Endecott, the first governor of the Massachusetts Bay Colony, sitting prominently in the background–I assume this is a Salem chair as that is where Endecott landed and lived (it certainly couldn’t be the English chair which accompanied his successor John Winthrop on the Arbella which is the subject and device of Hawthorne’s story “Grandfather’s Chair”). It’s really all about chairs for me, as even a casual reader of this blog would know. 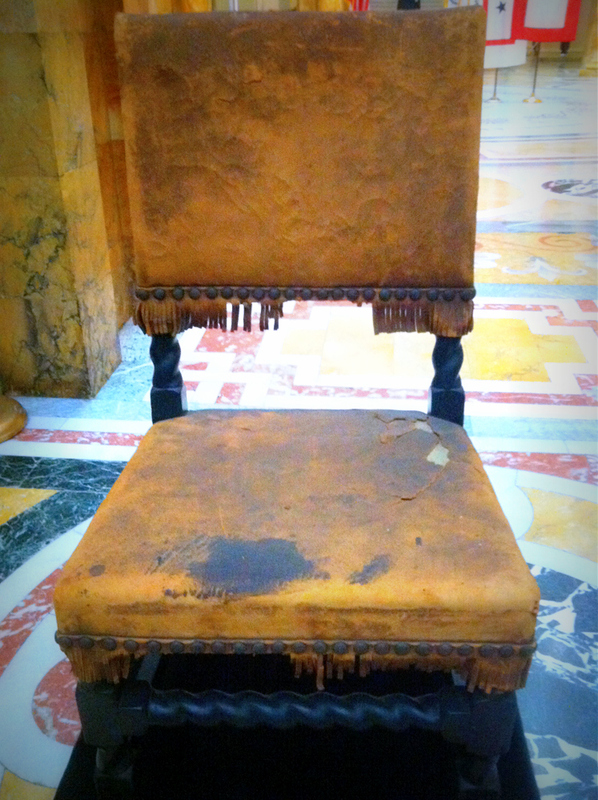 Just in my head, without going to Four Centuries’ great website or any of its events, I can immediately think of a chronological succession of great Massachusetts-made chairs–up to about 1830 or so: after that, I’m lost. 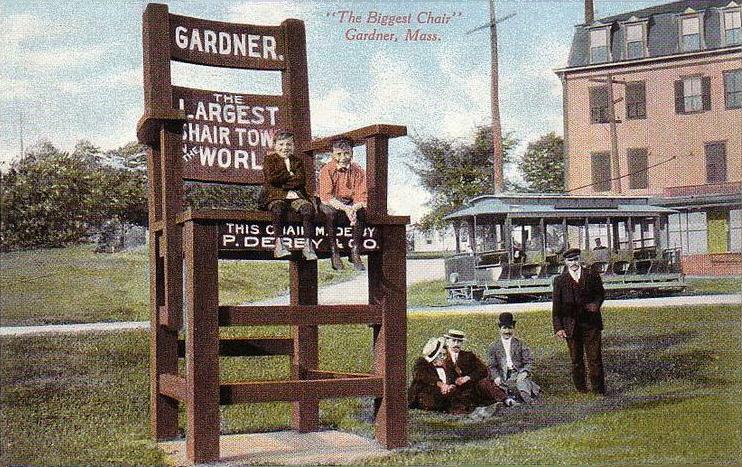 The nice thing about this initiative is its incredible time span, which must accommodate colonial craftsmen and Federal superstars like Samuel McIntire of Salem as well as industrial manufacturers in central and western Massachusetts, After all, Worcester held the title of “chair capital of the country” a century ago and Gardner is still proudly “the chair city”. So here we go: my own Four Centuries of Massachusetts Furniture, taken from a variety of sources and certainly informed by the collections showcased on the Four Centuries’ site: a particular discovery for me is Boston furniture-maker Samuel Gragg–amazing! Obviously there’s a bias here in favor of the early nineteenth century, but it was hard to choose favorites in general: Massachusetts really produced a lot of great chairs (more than all of the other original 12 colonies put together apparently) and continues to do so. Made in Massachusetts: Leather “Great Chair“, 1665-80, Boston (a near-contemporary of the Endecott chair), and Chippendale side chair, about 1770, Boston, both Museum of Fine Arts, Boston; Federal “Lolling” Chair made by Joseph Short of Newburyport, c. 1795; Federal armchairs made by Samuel McIntire for the Peirce-Nichols House in Salem, 1801, Metropolitan Museum of Art, New York, and in situ; “Fancy” side chair, probably Salem, c. 1800-1820, American Folk Art Museum, New York; Pair of decorated fancy chairs, attributed to Samuel Gragg, Boston, c. 1825, Skinner Auctions; Boston “Grecian” side chair, c. 1815-25, Winterthur Museum, Gallery & Library; Armchair designed by H.H. Richardson for the Woburn Public Library, Boston, 1878, Museum of Fine Arts, Boston; Shaker chairs at the Hancock Shaker Village near Pittsfield, Massachusetts, courtesy of Apartment Therapy; Armchair by Norman Lerner for Plycraft, Lawrence, Massachusetts, c. 1955, Skinner Auctions; “Arched and Animated” chair by Jay Stanger, Fuller Craft Museum, Brockton, Massachusetts. 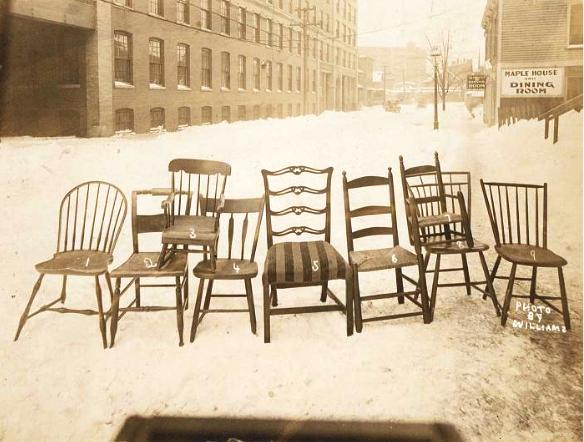 Another great line-up: chairs in the snow, c. 1910, Haverhill, Massachusetts. Smithsonian Institution. This entry was posted on Friday, September 20th, 2013 at 7:51 am	and tagged with Antiques, Crafts, Decorative Arts, design, Interiors, Massachusetts, museums, Photography and posted in Current Events, Design, Salem. You can follow any responses to this entry through the RSS 2.0 feed. Nice post, Donna! Aren’t we lucky! I always tell Tim I feel like we’re living in “Chairs ‘R Us” . . .. he has no governor on buying them! While it’s true that Shaker chairs were produced in Massachusetts (and a real expert, which I am not, can even tell you from which village a chair came), the majority of Shaker chairs were manufactured in Mount Lebanon, New York. I know, Brian–I was searching far and wide for a Shaker chair, and of course all the best examples came from Mt. Lebanon. And of course Hancock is about a half-mile from the New York border! But I wanted to get one in here. And I couldn’t tell a Hancock chair from a Mt. Lebanon chair, myself. If memory serves, at one time they had an exhibit in Enfield, NH, showing the difference between the chairs made in different villages. I just went poking through the catalog for the “Gather up the fragments” exhibit that’s now at Fruitlands, to see what range they include, but most are from Mt. Lebanon or Watervliet, NY.